Blush has created a beautiful polish for the Polish Pick Up, a pop up type shop that opens monthly with various brands of limited polish with a theme. This month's theme is Cocktails & Mocktails and will be open for pre-order on July 7th at 11am EST through Monday, July 10th at 11:59pm EST. 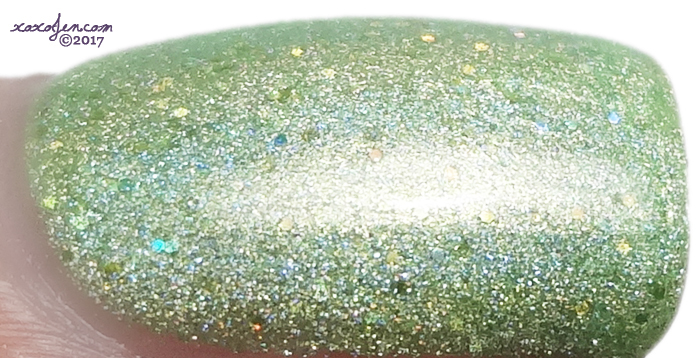 Blush Lacquer's Mojito Mondays was inspired by the drink and is a bright pastel lime based holo with gold shimmer and a smattering of gold to lime shifting holo glitter for sparkle. I wore two coats with topcoat in the photos, and the formula was excellent. I have enjoyed wearing this polish, it is a nice crispy fresh shade, perfect for warm summer days! See a preview of the other polishes in their facebook group! Really nice color and it does look and remind me of that drink too.